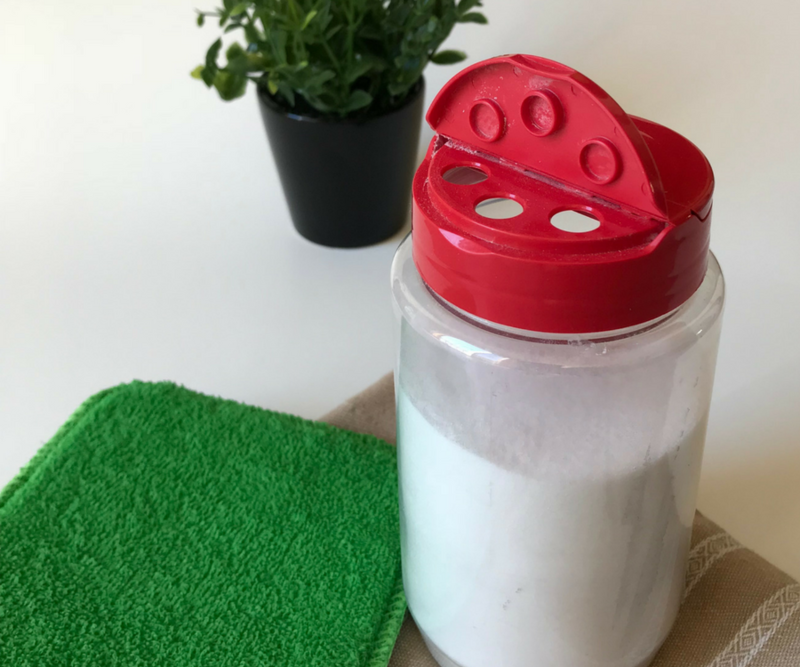 Learn how to strip your laundry to remove soap and mineral buildup – especially important if you’ve been using homemade laundry soap! If you’ve been using homemade laundry “detergent” to wash your clothes for any amount of time, I need you to listen up. Your laundry is NOT getting cleaned. It might look like it’s clean, and it might smell like it’s clean. But there’s a big problem lurking deep down inside the fibers of your clothing, towels, and linens. It’s very likely that your laundry is accumulating buildup from the minerals in your water, the soap from your homemade detergent recipe, and other dirt, oil, and bacteria. Too hard to believe? I don’t blame you! I felt the same exact way when I heard this for the first time. And I’ll tell you something else – I didn’t like it one bit. I was in complete denial about the whole thing. And honestly, the whole thing just confused the heck out of me. That’s why I’ve spent hours and hours since then researching, testing, and trying to get to the bottom of this issue. Sorry, back to business! Ok, so you want to start fresh with truly clean laundry, right? Right! 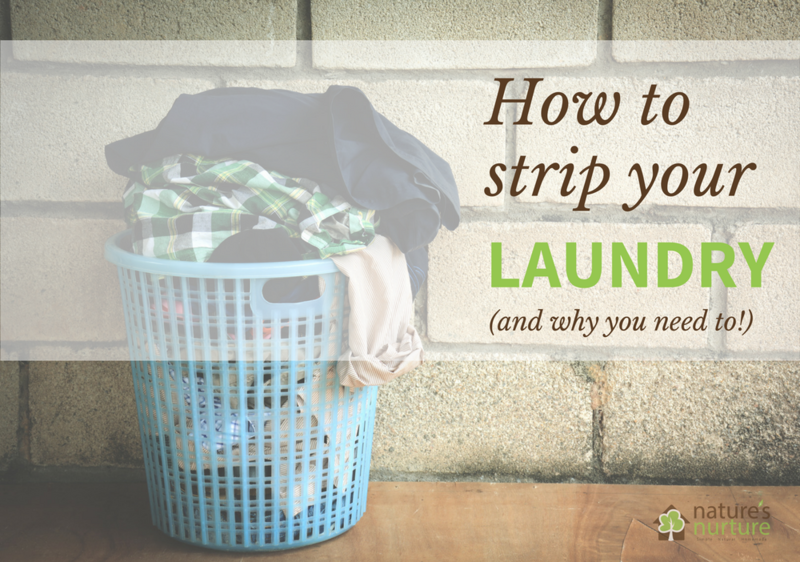 For help with stripping laundry, I’m looking to our cloth-diapering mom friends because they know a thing or two about laundry buildup. First, you’ll either make or buy a stripping solution. There are DIY stripping solution recipes at the links above, but I decided to go with something stronger. 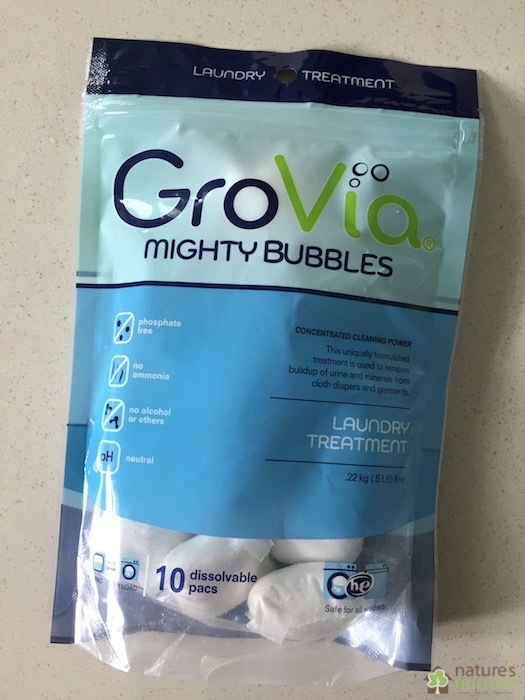 I highly recommend using the GroVia Mighty Bubbles solution as opposed to one of the other options because a) you’ll probably have a lot of build up especially if you’ve been using the homemade soap for a year or longer; and b) the Grovia pods have a higher concentration of enzymes, so they’re better for non-mineral buildup (i.e. we’re dealing with more than just a hard water issue here). Fill up your bathtub or a large container (or even your washer drum) about half way with very hot water – the hottest you can get from your faucet. Drop 2-3 Grovia pods into the tub (depending on amount of water), and watch as they start fizzing. Then give the water a good stir to help the pods dissolve completely. Add your laundry to the water, and use a long stick or pole to push everything under the water, making sure every item is completely soaked. Let it soak for about 4 hours, or until the water has cooled down. Make sure to go back every hour or so to give it all a good stir to help work the solution deep into the fabrics. Once the water has cooled, remove your items from the water – wringing them out very well – before moving them to your washer. I just put them into a large bucket, which I then carried down to the laundry room once I was done. Of course, if you did your soak right in the washer, you can skin this step and just drain the wash water instead. Finally, run your washer on a water only cycle (no detergents!) 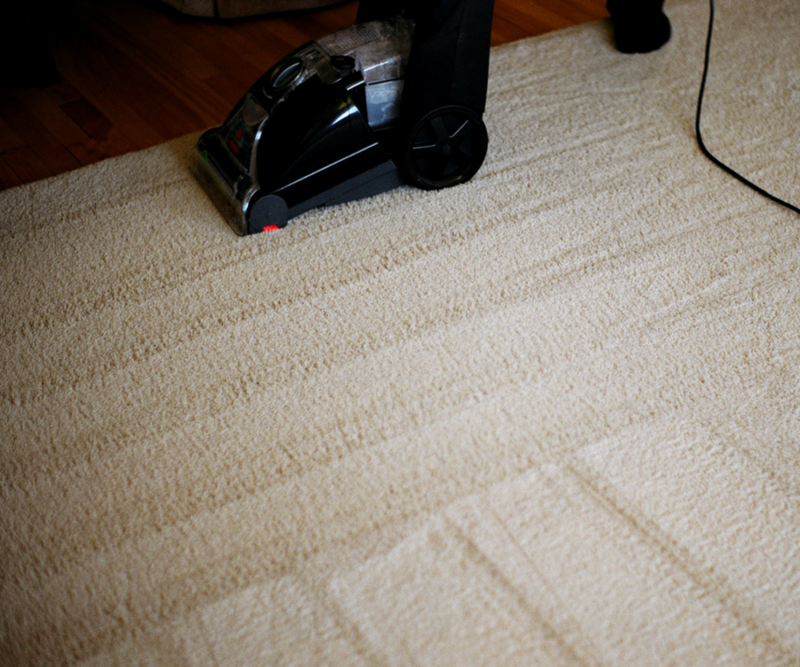 to rinse out any leftover residue from the stripping solution. If you stripped a fairly large load of laundry, you might need to split it into two rinse loads so you don’t overload your washer. Look at that… Just look at it! 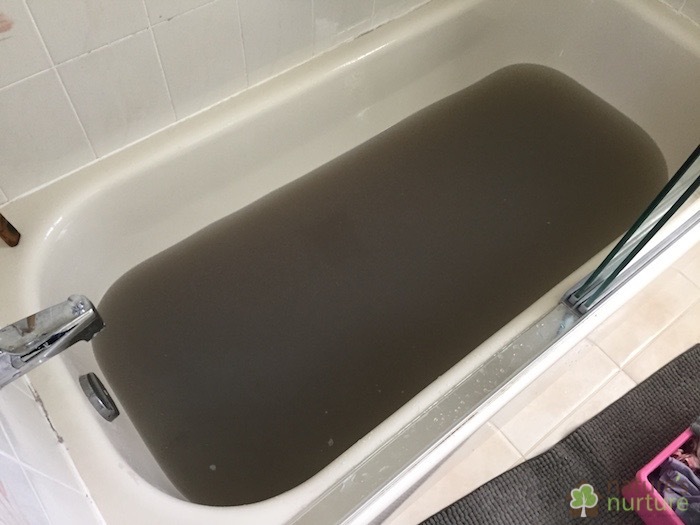 That brown, murky, funky water is what was stripped from just the light colored towels and linens. These are sheets and pillow cases that we’d been sleeping on for years. Towels that we’d been using to dry our hands, faces, and bodies. All of that nastiness was stuck in there, and I had no idea! Well, I had some idea, but I was just in complete denial about it. Then I stripped a load of dark colored towels and linens. That leftover water was even darker, but I suspect that might have to do with the very hot water stripping some of the color out of those fabrics. Either way, it still looked pretty funky. 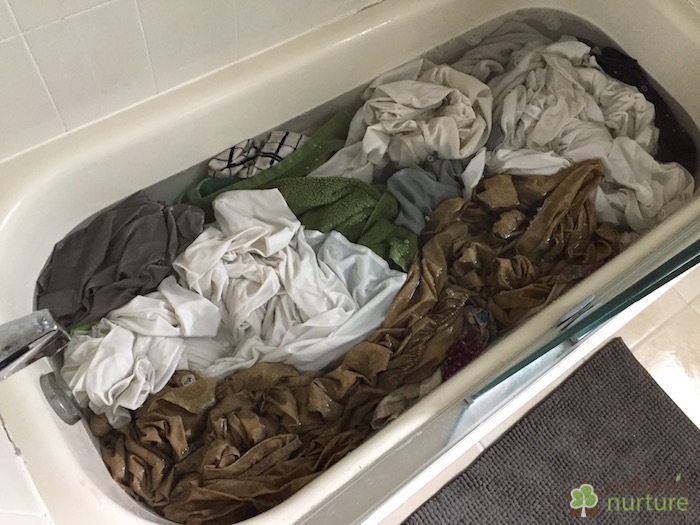 Finally, I stripped a load of just my and my husband’s light colored laundry – shirts, pants, undergarments, etc. I think this is the load that grossed me out the most. When I put my hand under the water to pull out the drain plug, I couldn’t even see my hand through all that murkiness…nasty! Mine and hubby’s light colored laundry. Thank goodness I didn’t experience any foul odor coming from the water, though some people have reported a funky smell – yikes! 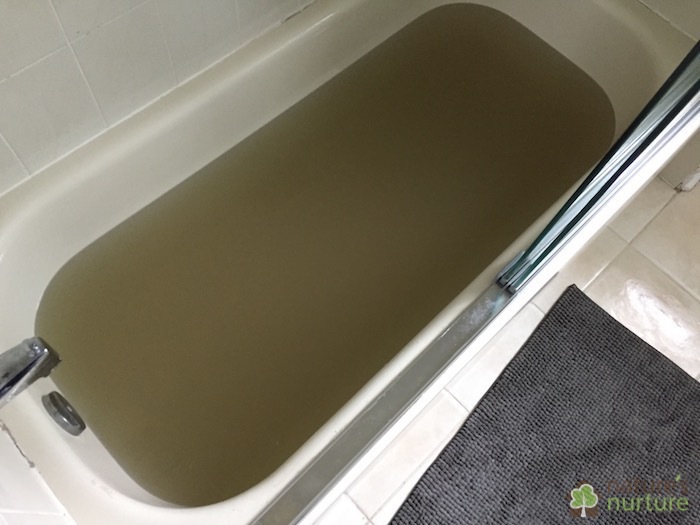 Pictures of murky water are good for shock value, but they mean nothing if we don’t also talk about how the newly stripped laundry actually feels, right? This was the best part, as it was icing on the cake. Our towels now feel noticeably softer than they were, and they are definitely more absorbent. The bed linens feel softer and smell fresher (no more stale smell). And the clothes, especially undershirts, feel and smell much better – and as an added bonus, the stripping actually removed some old sweat stains! Are you ready to strip your laundry? 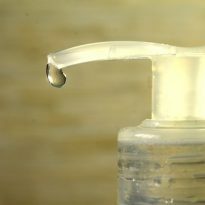 If you’ve only been using a homemade laundry soap for a few months, or even a year, you may not necessarily notice a buildup issue yet. 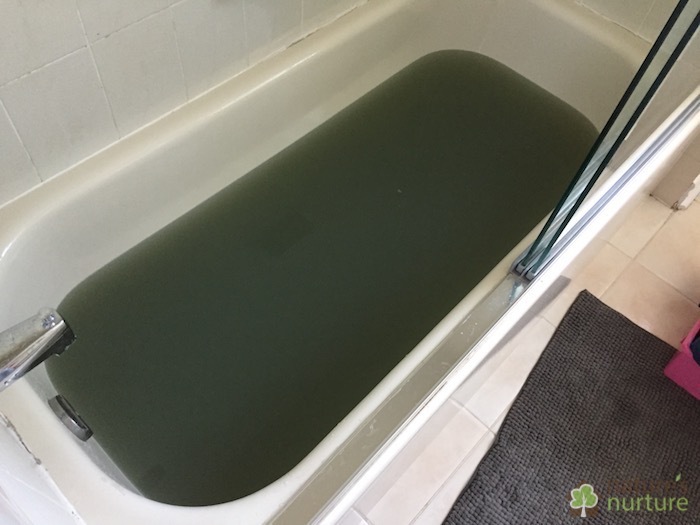 If seeing my stripping water has scared you straight, you can probably get away with just switching to a non-toxic laundry detergent, and moving on with your life. I actually decided against stripping the kids’ clothes because right now they’re not holding on to them for longer than a year before they’ve outgrown them anyways. But if you suspect even the tiniest issue, I suggest you get on this laundry stripping business as soon as possible, and start looking for a replacement laundry detergent from now. Have you noticed a buildup issue after using your homemade laundry soap? Please share in the comments below! 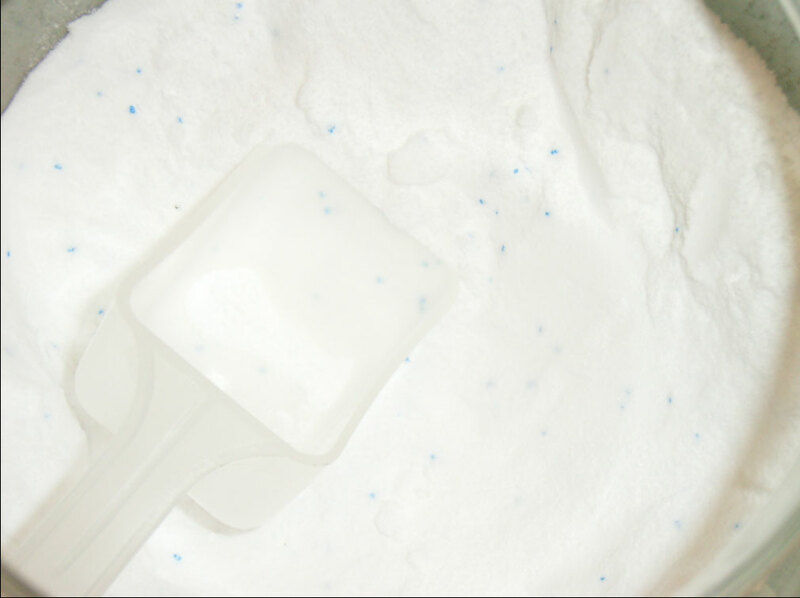 Next Post Your Homemade Laundry Soap MIGHT Be Ruining Your Laundry! Thank you so much for this! 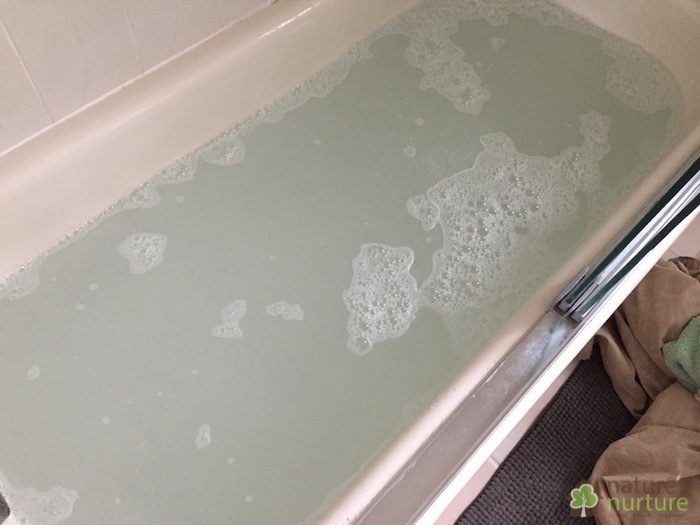 I only used homemade laundry soap for a few months and although the first two to three washes were really clean and fresh, it just got worse and worse over time. 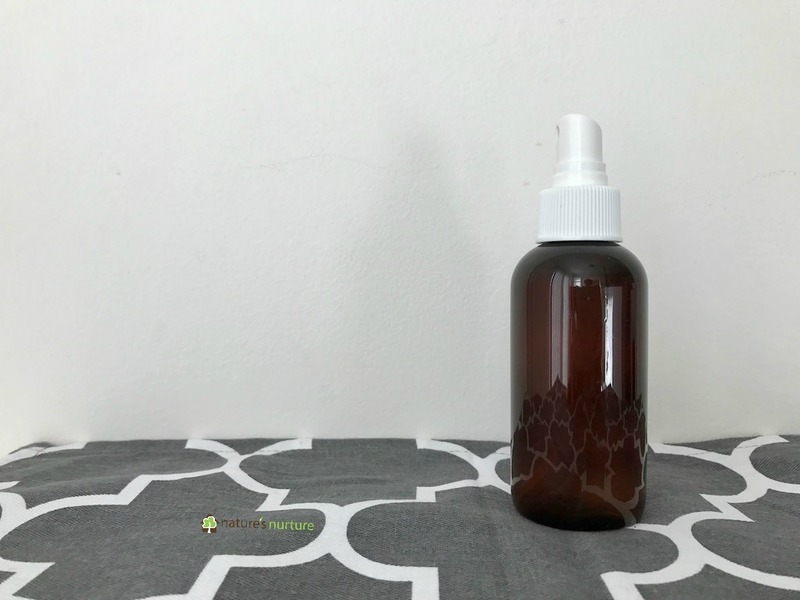 We have really really hard water (which I had taken in consideration regarding the ingredient ratio) and our clothes just got stiffer and stiffer and the colours, especially black, started to look very greyish. I then noticed after a few months, that our machine had a grey/white residue inside the drum. I think it took me three 90° C cleaning cycles with citric acid to get it back to a good condition. During these cycles, the water inside the machine looked like your stripping water but with little pieces mixed in… gross. 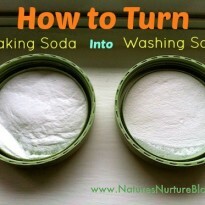 I switched back to our natural detergent from before, which I had always been happy with. While this improved the situation drastically, the results just weren’t as good as before the homemade laundry soap. I have a tub full of dark clothes stripping now and hope this will be the solution, the water already looks very murky ;). A tip for fellow German/European readers: I couldn’t find the Gro Via Mighty Bubbles here, but found “miofresh nappy cleanser”, which seems to have the same/similar ingredients :). Oh my, Sophia, what a story! I’m glad you’re slowly figuring this out and hopefully reversing the damage. Thank you so much for sharing your tips, especially for our European readers! I use dr bronners (diluted) for hand soap and body wash. We have a water softener, & I always wash towels and wash cloths on hot, regular cycle to be sure to get all of the oil based soap (& dirt & ickies) out. But now I’m concerned its not really getting bath linens clean! 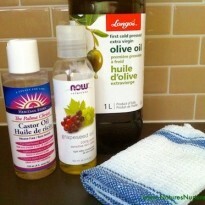 I use all free & clear (I have incredibly sensitive skin, and so does my son). Do you think I should strip them? I am having such sad and mixed emotions! The dr bronners has been a miracle on my skin, severe eczema has tormented me my whole life….& the all is the only free & clear i’ve tried that doesn’t cause a skin reaction! But one of the links you gave said all can cause residue too!?! Help! Hey Rachel, I can’t say for sure about All Free & Clear. 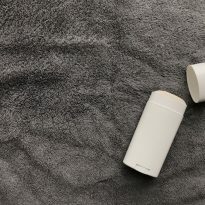 I do know that most conventional detergents by default can leave a residue, especially if they’re claiming “brighter and whiter whites!” – the optical brighteners they add that allow them to make those claims are, by their nature, going to remain on the laundry to make it *seem* like it’s brighter and whiter. It’s crazy, I know. That being said, if you’re not having any issues, I would just keep doing what you’re doing. If you’re truly concerned about the bath linens, you could try stripping them to freshen them up, and then start adding some extras in the wash machine during the wash cycle. 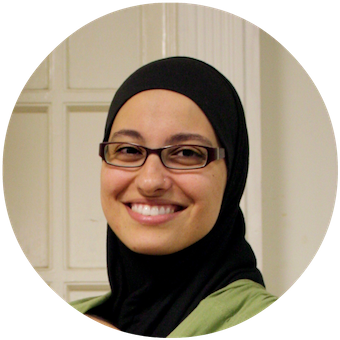 You can check out this post for some ides. For the record: both of these women had the same results stripping their laundry, and both of them use regular laundry detergent (Purex for the first, and All Free and Clear for the second.) I don’t think your homemade laundry soap is to blame. Oh my goodness, thank you so much for sharing these links with me! I’ve been hoping to find someone who tested this after using regular detergent so we could compare. Thanks again, Danielle, I’m going to take a look and reassess. What are you using for laundry soap now? 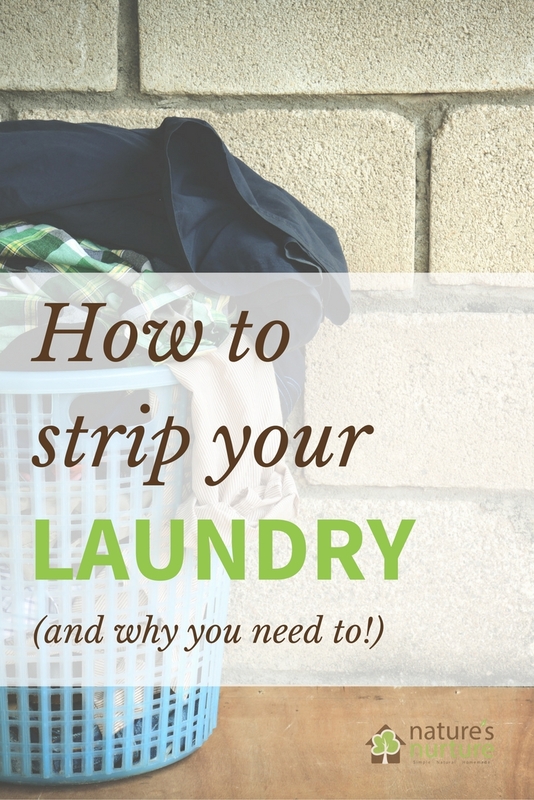 Have you tried the stripping with store bought laundry soap to see if it does the same thing? And to answer your first question, I’m using a detergent from a Canadian company called Nature Clean. 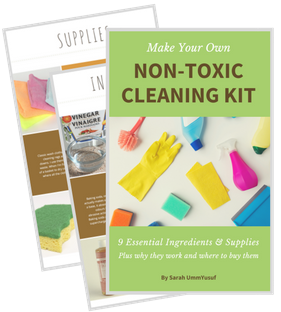 I’m also putting together a guide to help you choose a safe, non-toxic laundry detergent as well. Will just switching to proper detergent help or do i have to strip everything first? 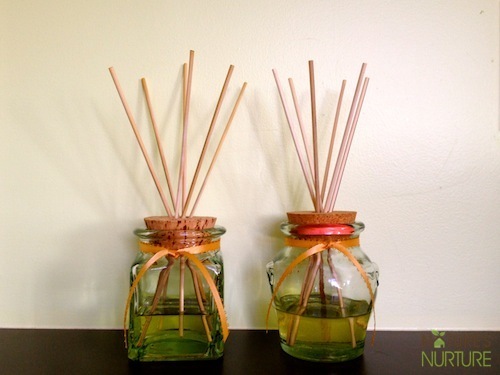 That all depends on how long you’ve been using your homemade laundry soap. Since I’d been using mine for well over 5 years, I knew I just had to strip it all. If I was using it for maybe a year or so, then I’d probably strip only the items that I believe really needed it. 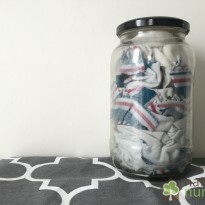 So a different question to ask is: what laundry items smell/look/feel like they have a buildup problem? And then go from there. Best of luck to you! Where has this blog post been?? Thank you for doing this. Your wisdom on these topics is showing me how easy it is to live non-toxic. And now I need to get those pods. Clicking over to add them to my list. Thank you Sarah! !